The classical outwelling hypothesis states that small coastal embayments (e.g. estuaries, wetlands) export their excess production to inshore marine waters. In line with this notion, the present study tested whether the Swartkops estuary acts as source or sink for carbon. To this end, concentrations of dissolved inorganic carbon (DIC), dissolved organic carbon (DOC) and particulate organic carbon (POC) were determined hourly during the first monthly spring and neap tides over one year in the tidal waters entering and leaving the estuary. Each sampling session spanned a full tidal cycle, yielding a total of 936 concentration estimates. 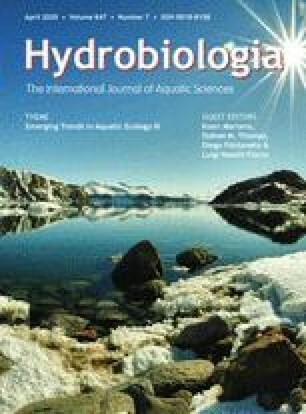 Carbon fluxes were calculated by integrating concentrations with water flow rates derived from a hydrodynamic model calibrated for each sampling datum. Over the year, exports to marine waters markedly exceeded imports to the estuary for all carbon species: on the basis of total spring tidal drainage area, 1083 g m−2 of DIC, 103 g m−2 of DOC, and 123 g m−2 of POC left the estuary annually. Total carbon export from the estuary to the ocean amounted to 4755 tonnes, of which 83% was in the inorganic form (DIC). Thus, the bulk of carbon moving in the water column is inorganic - yet, DIC seems to be measured only rarely in most flux studies of this nature. Salt marshes cover extensive areas in this estuary and produce some carbon, particularly DOC, but productivity of the local Spartina species is low (P:B=1.1). Consequently, the bulk of carbon exported from the estuary appears to originate from the highly productive macroinvertebrate and the phytoplankton component and not from the salt marsh plants.